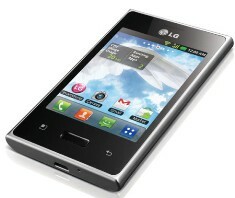 The LG Optimus L3 E400 runs on the Android 2.3.6 Gingerbread operating system. It has an 800 MHz processor. Phones comes with LG SmartWorld, so that user can download a number of applications. It has 3.2 megapixel primary camera and for connectivity phone has various options like GPRS, EDGE, 3G, Wi-F, Bluetooth and microUSB, The phone comes with 1500 mAh Li-ion battery with internal memory of 1 GB which can be expanded up to 32 GB.